In the CPTV Original series You Are Cordially Invited, Connecticut-based interior designer and author Holly Holden visits elegant homes and engages the proud homeowners in discussions about style, design, architecture, collecting, and entertaining. Now, follow Holden on a trip “across the pond” in two special episodes! 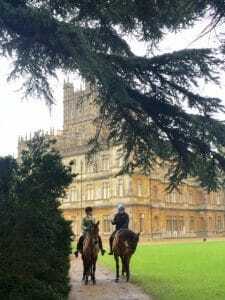 In You Are Cordially Invited: Highclere Castle, Holden accepts an invitation from Lady Carnarvon to visit Highclere Castle – which, as many Downton Abbey fans know, served as the main filming location for the beloved drama. Travel to England for an exclusive, historical tour of the incredible manor where much of the series was filmed! In You Are Cordially Invited: Blenheim Palace, go with Holden as she tours Blenheim Palace, a monumental country house located in Woodstock, Oxfordshire, England, that serves as the prin­cipal residence of the Dukes of Marlborough.